Suspension quality – better quality suspension will keep the bike more balanced and will stop the bike diving forwards putting way too much stress through the front wheel. Road surface – a bumpy road will lead to less grip, and as the front and rear of the bike traverse the bumps, grip is diminished and increased in each wheel at different times, depending on the loading of the wheel. 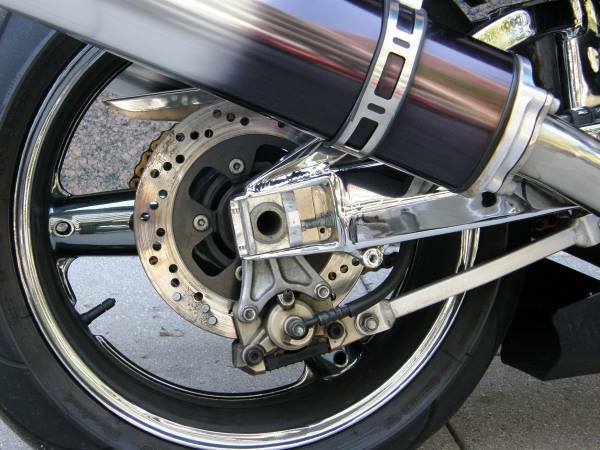 Modern motorbikes usually come with disc brakes at the front and back. The image shows a cross-drilled front brake (it has holes drilled in it for heat dissipation). This disc is clamped by pads moved by pistons (you can see brake calliper on the top left). The bigger the brake calliper and the bigger the disc, the more heat that can be dissipated, and that reduces the chance of brake fade, as well as provides more actual stopping power. Of course, you shouldn’t overcome the grip on the road because a front-wheel skid usually means you will crash because the wheel will slide from under you. The overall stopping performance is affected by your suspension, tyre’s grip on the road surface and braking strength. The back brake is relatively smaller because it has less work to do. How does braking work on a motorbike? When you apply the front brake the centre of gravity of you and your motorbike resists the deceleration force by shifting weight forwards. This puts more pressure through the front tyre than the rear tyre. In heavy braking scenarios the rear tyre can lift off the ground, and you will see this frequently in motor racing like MotoGP. As the rear wheel lifts, it has only very light contact with the road surface and therefore can lock easily, causing you to skid. If the rear wheel lifts too far then you are at risk of going over your handlebars. You also need to be careful not to initiate a front-wheel skid, especially where the road surface is slippery through water, frost, leaves, mud or gravel on the road. If you lock the rear wheel the engine will stall unless you have the clutch in. But, by bringing the clutch in you increase the chances of the rear wheel locking because there’s no engine force driving the rear wheel. As you change down while decelerating, try to match the revs otherwise when you reengage the gear the extra engine braking caused by the revs climbing can cause the rear wheel to lock. Take care not to over-rev the engine on downshifting or the rear wheel could lock, and you might damage your engine. 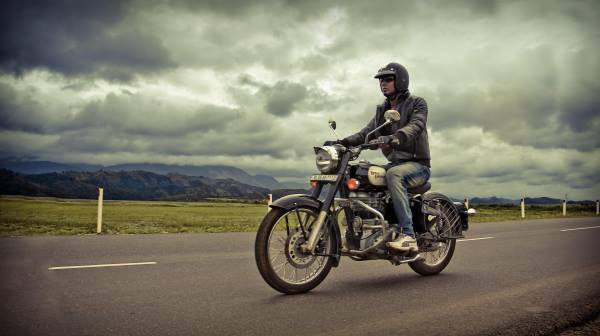 If you do anything to adjust the weight balance on your bike, like carrying a pillion passenger or luggage, you may need to adjust the suspension and tyre pressures to compensate. See this article for tips for carrying pillion passengers. It’s advisable to carry luggage as low as possible to keep your centre of gravity low, which aids in stability and cornering. 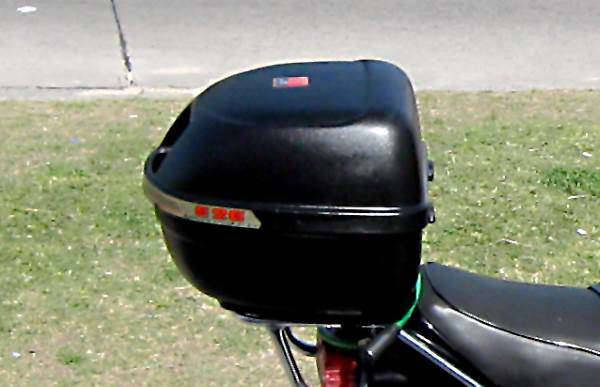 A top box, like in the image below, has a higher centre of gravity than side panniers. Good riders plan ahead and finish their braking before they start turning. If you have to slow down more in a corner it’s often better to use more rear brake than front brake, or to use engine braking. Apply the brakes progressively, i.e. don’t brake sharply, but anticipate your braking point then apply the brakes gently, gradually increasing the brake pressure. Just before you stop, ease the brakes off so that you don’t come to a jerky stop. You should have changed down through the gears and be in first gear by the time you stop. Pull your clutch in and keep your foot on your rear brake when you stop as this will stop you rolling backwards if you are on an incline. Be aware of your stopping distances for a motorbike. The stopping distance is made of the thinking and braking distance combined. Your thinking distance will be influenced by your alertness, hydration, age and ability to recognise the danger. Your braking distance will be influenced by your tyre pressures and compound, suspension, brake balance, road surface, weight distribution, road gradient, wind resistance and overall weight. Note that increasing the speed from 30 to 70mph almost quadruples the braking distance, even though it only just over doubles the speed. When you need to stop quickly you will have many more options if you have been scanning and using your mirrors. These two precautions will let you see more opportunities for escape routes. The quickest stops are performed in a straight line using both the front and rear brakes together. Apply the front brake just a fraction before the rear brake. 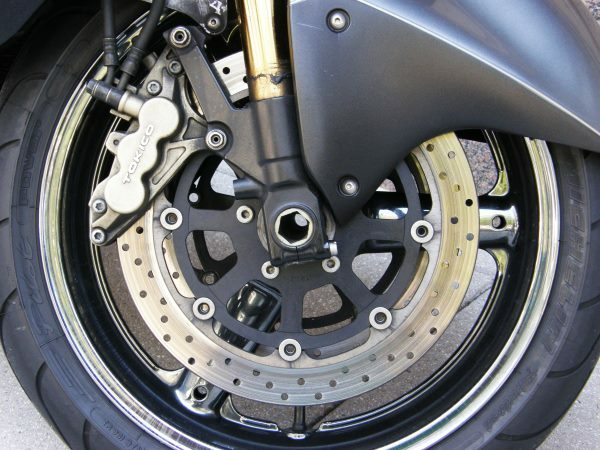 If your motorbike has ABS (antilock brakes), then simply apply the brakes as strongly as you can. If you don’t have ABS you will need to try to feel the point at which the wheel is about to lock and modulate your braking around it. Your tyres need to deal with braking, accelerating and turning forces, all through a patch of rubber no bigger than your hand on each wheel. By maintaining a straight line as you brake, the tyre doesn’t have to expend any force turning – any force turning reduces the amount of potential braking force available, lengthening your stopping distance. It also increases your risk of having a lowsider accident (click here for video examples). Motorbikes take longer to stop than cars and don’t have as much cornering ability. Braking on a slippery surface provides extra dangers for the motorbike rider. As you are balanced on two wheels, any gradient in the road will cause any locked wheel to slide that way, which is more dangerous with the front wheel than the rear wheel. If possible, just use engine braking to slow you down if you spot a slippery surface. Slippery surfaces include spilled diesel, mud, leaves, ice, gravel and wet painted road markings. Use your feet as outriggers in case you need to give yourself more balance. If a wheel does lock, release that brake then reapply it. If your rear wheel begins to slide to the left, correct the slide by steering to the left, but be careful not to over-correct or you could end up in a highside accident. Brake face occurs when you overheat the brakes and they stop working. Brake fade on the road with a motorbike is unlikely unless you are making a long downhill run and you are not using engine braking. However, if you ride on a race track then you are at more risk of brake fade. If you carry a pillion passenger then your brakes need to dissipate more heat and are at more risk of overheating. Riding through deep water has the same effect as brake fade. The water creates a low-friction cushion between the disc and the pad, stopping you from braking. If your brakes were already warm, they will dry off quickly, but it’ best to apply the brakes after you have been through a ford or deep puddle. Don’t give arm signals when braking heavily because you need to maintain as much control over the motorbike as is possible.